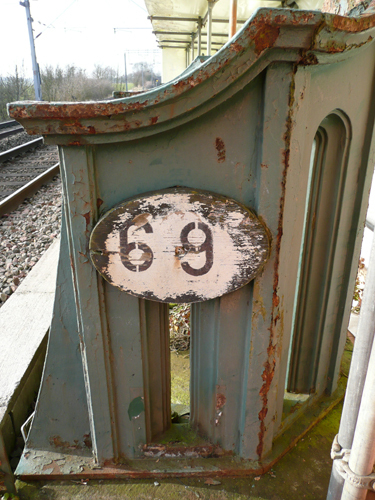 Bridge 69, known as Pulpit or Armchair bridge, is on the Hanslope-Northampton-Rugby Loop Line and was built by the London & North Western Railway in 1877. Its site is close to the village of Watford in Northamptonshire. Its design was specified by the local peer Anthony Henley, 3rd Baron Henley of Chardstock in the County of Devon (1825-1898), and it marks the point where the new line crossed the estate’s north ride, within sight of the north elevation of the family seat, Watford Court. Henley was the son of Robert Henley, 2nd Baron Henley. He succeeded his father as third Baron Henley in 1841 but, as this was an Irish peerage, it did not entitle him to a seat in the House of Lords. He was instead elected to the House of Commons as MP for Northampton in 1859 – a seat he held until 1874. Lord Henley married, firstly, Julia Emily Augusta, daughter of the Very Reverend John Peel, Dean of Worcester, in 1846. After her death in 1862, he married Clara Campbell Lucy, daughter of Joseph H S Jekyll, in 1870. Clara was the cousin of the as-yet-unknown garden designer Gertrude Jekyll. 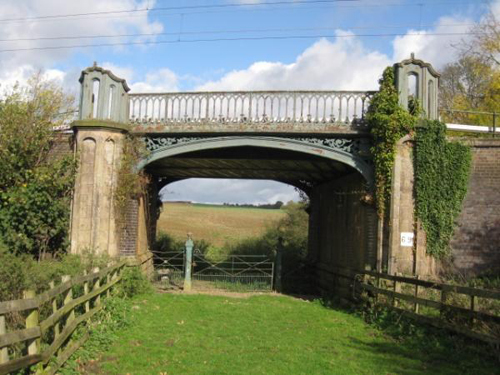 According to local people, the aim of the bridge’s unusual look was to placate villagers who were upset by the coming of the railway and its resulting impact on the beautiful parkland thereabouts, as well as their religious observances. Lord Henley was a lay rector who is believed to have taken Rogation Services for estate workers on or near to the north ride, reflected in some of the bridge’s unique ‘pulpit’ features and ‘ecclesiastical window’ echoes in the balustrade. In 1885, the Northington title held by Lord Henley’s great grandfather was revived when he was created Baron Northington of Watford in the County of Northampton, in the peerage of the United Kingdom. This title gave him and the later Barons an automatic seat in the House of Lords. Pulpit Bridge marked the point where trains would halt to take Lord Henley to London and his seat in Parliament, linking Watford with world affairs. He died aged 73 in November 1898 and was succeeded in his titles by eldest son Frederick. Lady Henley died in 1922. The bridge seems to have been created as a multi-purpose feature – partly an open-air church, partly a piece of railway infrastructure, partly a garden feature and partly a private railway halt. 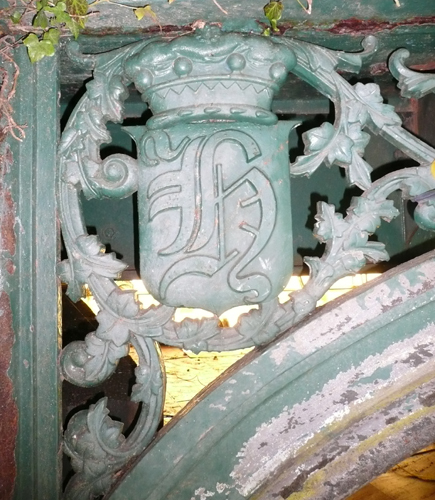 The design is believed to be unique and the ironwork still bears the monogram of the Henley family. Group value: the bridge has group value with other designated assets within the former estate of Watford Court. 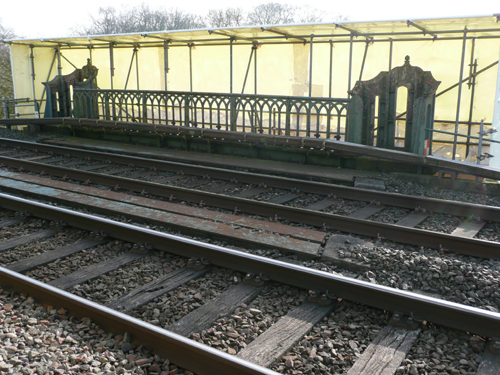 The bridge is currently being repainted and repairs made to the brickwork. 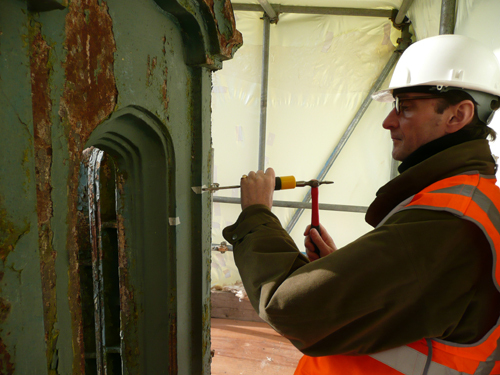 As part of the work I was asked to carry out an analysis of the decorative schemes applied to the bridge. This has been taken almost vebatim from Forgotten Relics of an Enterprising Age by Adrian Snook. Information has also been taken from the English Heritage listing. I hope you will show us a picture of the bridge when the renovation is complete! It is great to see the lovely old “bridge with three names” finally undergoing such diligent expert restoration after so many years of sad neglect. It would be great to know the outcome of your assessment. Did you find any remnants of the gilt paint referred to by Martin Smith? I have copies of the original plans for the bridge, which specify that Iron Pulpits should be painted to match the supporting stone-work. I imagine that could create a bit of a dilemma in terms of historically accurate colour matching – since the stonework will since have weathered a bit since 1877. How will you handle that? I can’t wait to see the finished result. Fascinating, Patrick. I grew up around this bridge, I lived in the village of Watford, and my grandparents in Watford court, sadly no more, due to my uncle’s wanton neglect! Thanks Chris. It really is the most splendid bridge and virtually unknown. Yes, we all have a tale to tell about the folly of previous generations. If only…. We have already plagiarised your excellent article about Pulpit Bridge – which now appears on the ‘Railway’ page of our website. 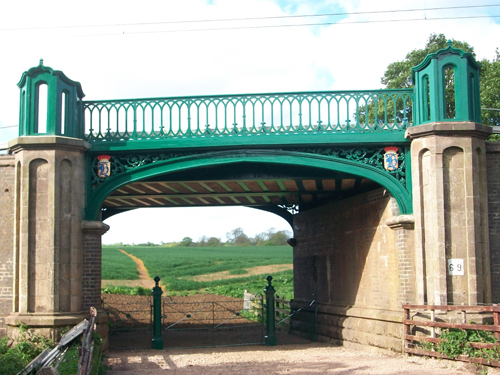 We have recently been given a photograph of the bridge once the restoration work was undertaken by you. It looks absolutely fantastic now and we would be keen to add as much information as possible on the website about how this was achieved. IE when, by whom, how, special considerations, etc. together with any photographs or plans that you maybe able to provide. The Watford Village history project is quite new and only been operating for a few months, – so it would be delightful if we were able to add the details of this truly wonderful restoration that you have done. How interesting, It is not to far from me I will have to go and have a look. A very elegant structure, has the colour scheme changed over the years?